Woohoo! It’s time for the #61 “Pretty In Pink” Challenge at The Card Concept! 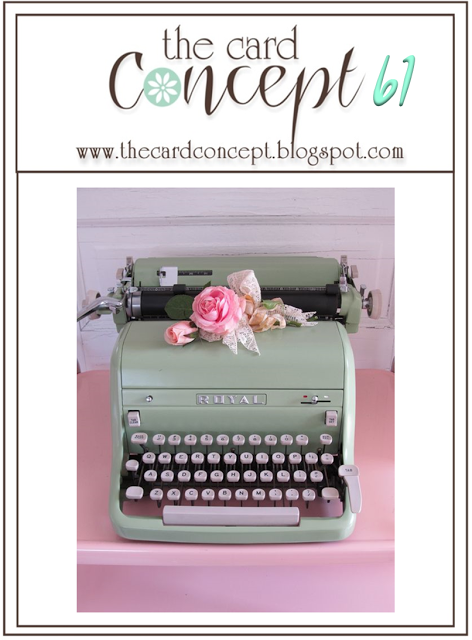 Our inspiration photo has so many gorgeous elements that can be interpreted in different ways- the soft colors, the flowers, the typewriter, etc. Remember, do not be intimidated by an inspiration photo- there is no right or wrong way when it comes to interpretation and we hope to see your card in our gallery!! 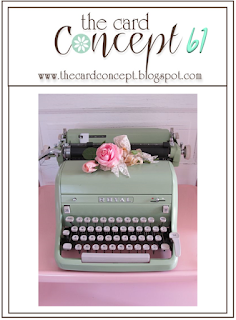 If you have not had a chance to visit any of the challenge sites yet, I hope you will find the time to visit us at The Card Concept as well as the Splitcoaststampers and Word Art Wednesday challenge sites- fabulous inspiration from all!! Cut the pieces of retired Graphic45 Botanical Tea designer paper to approx. 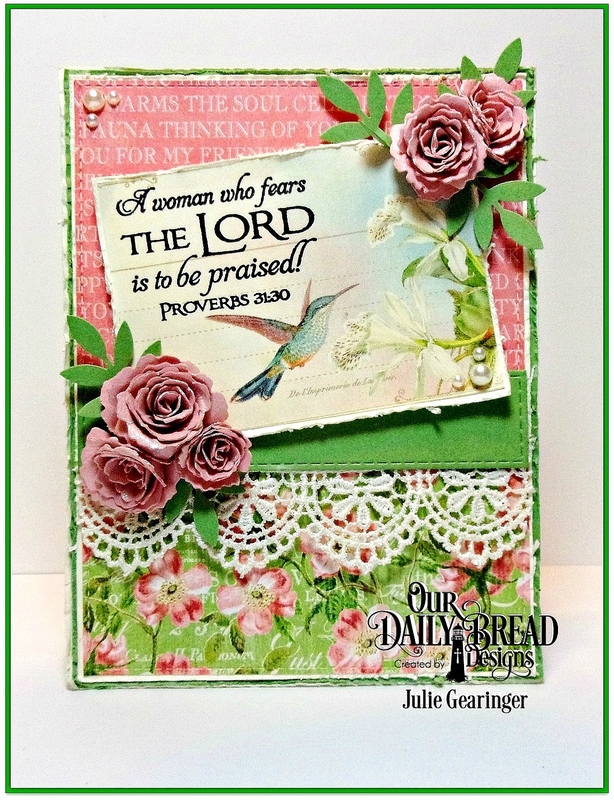 4” x 2.5”, distress the edges with a distressing tool, mount onto vanilla cardstock, distress the edges again and add the ivory crochet lace with the wasabi die cut rectangle (to hide the edges). 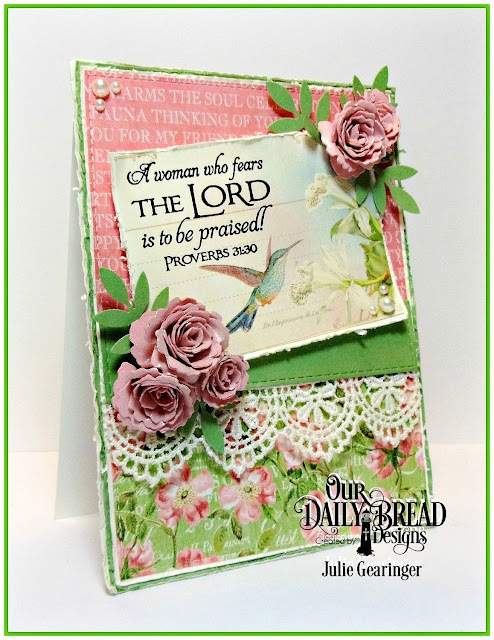 Mount the panel onto a piece of wasabi cardstock, distress the edges and mount onto the vanilla card base. Ink the Our Daily Bread Daily Bread Designs Scripture Collection 4 verse with black archival ink and stamp onto the retired Graphic45 Botanical Tea cut apart. Distress the edges, mount onto a piece of vanilla cardstock, distress again and add to the card front with dimensional foam. Create the rolled flowers from blushing bride cardstock (I had these already in my stash and had used the retired MFT Large Royal Rose and Royal Rose dies). Add the flowers with leaves (punched with the MS Leaf Punch from wasabi cardstock) to the card front (I used hot glue to adhere) and add the pearls to the upper left hand corner of the card front and the lower right hand corner of the sentiment. To finish off the card, use a clear glitter pen to add shimmer to the roses and hummingbird. This card has quite a bit of dimension and I decided to hand-deliver to the wonderful lady who leads our Monday eve, Bible Study- she is definitely a woman who fears the Lord and a sweet sister in Christ! Thanks again for taking the time to stop by! I hope all of you have a fabulous week and hope you can join us for the #61 Pretty In Pink Challenge at The Card Concept! I love your wonderful card! 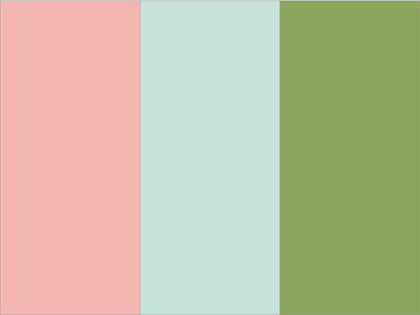 The colors are so soft and pretty together! Great design! This is layered in shabby chic prettiness!! I like your rolled roses. Wonderful card! Gorgeous! I love your designs...they are always stunning. This is just pure shabby goodness, Julie! Beautiful card! Julie I just love your shabby rendition of our challenge. Totally luscious!! I love the bible verse too.